A flashlight is an essential tool that every person should carry with them. It doesn’t matter if it’s for hunting, fishing, looking for lost items in the yard, using during a blackout, or needed for shooting, it really helps a lot. With different types of flashlights on the market, you should select a light that meets your needs. Read this Streamlight TLR 4 Review to know further. The streamlight tlr 4 LED flashlight is a powerful light with excellent features. It is built for shooters but can be used for various activities, too. It is constructed from polymer and anodized aluminum. This comes with three light position mode selector switch for choosing laser only, LED or Laser, and LED only. It depends with which light you need. Also, it has a rail clamp with a key kit included for attaching different subcompact, compact, and full-size handguns with rails. You can also compare this light with streamlight tlr 6. Run time: 1.5 hours of continuous runtime when in dual mode with the high power visible laser. Operating the flashlight is easy as it comes with an ambidextrous switching for momentary on or steady on light. The light is lightweight and compact for easy use with the gun. The C4 LED bulb makes the torch to be more reliable and provides very bright light with a maximum of 125 lumens and 50, 000 hour life time. Moreover, the manufacturer offers a limited lifetime warranty on this black streamlight tac light with laser. 3 Why choose streamlight tlr 4 light? Why choose streamlight tlr 4 light? A tactical flashlight should be well built so that it can withstand different tough conditions in the areas that it is used. 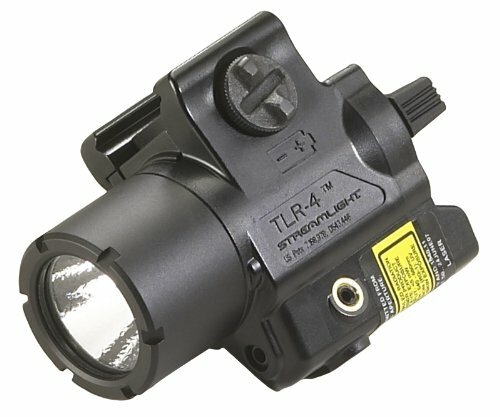 The streamlight tlr 4 light is a good example of a durably made light for outdoor and weapon use. This flashlight is built with an impact resistant engineering polymer. In addition, the face cap is built using 6000 series machined aircraft aluminum with black anodized finish. Aluminum and polymer are very durable materials that will keep the flashlight in good conditions even if it falls a few meters off the ground or when it is crushed in line of duty. There is no a reliable and powerful bulb like LED. Streamlight tlr 4 torch comes with C4 LED bulb that has a 50, 000 hour lifetime. Furthermore, LED bulbs are resistant to shock and function well in different conditions. Also, the C4 LED has 5000 c and ela peak beam intensity. It produces a maximum lumen of 125 which is the brightest. The textured parabolic reflector creates a concentrated beam with optimum peripheral illumination. All-in-all, the LED bulb is very reliable and uses less energy than other types of bulbs. So, it makes this flashlight to be better. The type of battery a flashlight uses is very important. This is because the battery plays a role in how long the torch runs. Lithium ion batteries are the best because of their power and most of them are rechargeable. Streamlight tlr 4 led light uses just one 3-volt CR2 lithium battery. The battery can run for 1.5 hours if the light is set to LED only or Led and laser. On the other hand, it can function up to 11 hours when the light is switched on laser only. As you prepare to go out hunting or to battle, you need to keep things light so that they don’t weigh you down. One of the things to consider is a lightweight flashlight. This flashlight from streamlight is made of polymer and aluminum which are light. It weighs 2.8 ounces with batteries included. This means that it won’t be a burden to you as you can on with your shooting or hunting activities. Also, the compactness of the light enables it to be fitted on different guns with much ease. There are some weapon flashlights on the market that are challenging to attach or detach to your gun. But with the streamlight tlr 4 light, it has a rail clamp built to quickly attach or detach from side of weapon. Also, when attaching the flashlight on the gun, it is a one handed snap-on and will keep away from interfering with the muzzle. The LED flashlight is set up on different weapons using the key kit included in the purchase. 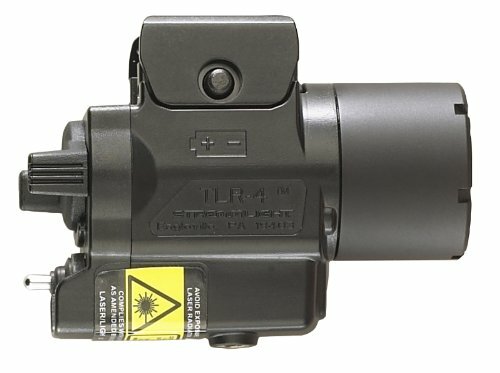 Being a tactical light, the streamlight tlr4 torch can be utilized in various ways and it’s not just limited to shooting or on guns. The tactical light can as well be used for hunting, hiking, and by law enforcers. Some of the guns that it can be attached include Beretta, Kimber, Glock, Sig sauer, Ruger, and Smith & Wessen, among many others. One of the reasons clients love some products over others is due to their simplicity in use. This weapon flashlight from streamlight is one such product. It comes with ambidextrous momentary/steady on or off switch. This enables one to switch on LED, Laser or LED and Laser lights without any problem. The user just requires positioning the switch to the light that they want. Also, the rail clamp is easy to attach or detach on the weapon. Some flashlights cannot be relied on to deliver in tough conditions. This is not the case with the streamlight tlr 4 tactical light, it is built from durable materials that can withstand harsh surroundings. The IPX4 rated design is resistant to water. Also, the C4 LED performs well in snow, smoke, rain, dust, and other tough conditions. But you will still receive quality light from it. Since it is made in the USA, the streamlight is an excellent light and meets the standards set. Also, it meets the applicable European Community directives. So, there is nothing to worry about when you purchase this outstanding flashlight for outdoor use or to attach on your subcompact, compact, and full size handguns with rails as you shoot. Unlike many brands, streamlight offers warranty on most of its lights. The warranty varies from one flashlight to another. The brand offers buyers of the streamlight tlr 4 led light limited lifetime warranty. This assures the buyer that they are acquiring a quality product and if it comes with an issue, they can get the much needed help from the manufacturer. Streamlight tlr 4 LED light is outstanding in performance and very durable. The long range red laser can be used to aim at targets, while the LED light can be used to light the path or a dark area. It is durably made and the user can be sure to use the flashlight for a very long while. Also, the weapon flashlight can fit on different types of guns by using the key kit provided to attach or detach them from the rail clamp. Still, have a question after reading this Streamlight TLR 4 Review? Comment below.